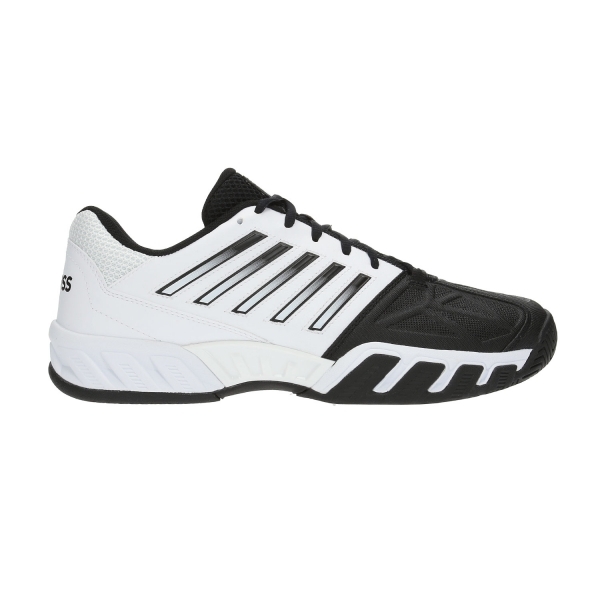 The K-Swiss Bigshot Light 3 men's tennis shoes offer lightweight and stability: Synthetic leather upper with insert on the forefoot guarantee support and breathability. Suola adapt to all type playing surfaces. High–density outsole pro- vides unsurpassed dura- bility from heel to toe. The ultimate abrasion resistant rubber compound in the highest wear area. Provides an extra line of defense against exces- sive toe–dragging. Special formula EVA to provide maximized cush- ioning and enhance dura- bility of the midsole. A 180 degree thermal plastic Plantar Support Chassis that enhances mid-foot stability. Put on a pair of socks usually worn with the shoe and measure your feet in the afternoon (often, the feet swell during the course of the day). Stand on ones feet on hard surface and position a sheet of paper under your foot. Distribute your weight in a uniform fashion. Measure from the border of the sheet of paper under the heel to tip of the foot, which more or less is the second toe (as seen in the photo). Use a ruler to measure the length taken in centimetres. Add one centimeter to the result and convert using the table above.